I’ve already posted my review of Super Mario Odyssey and the massive disappointment it was for me, but I want to take a closer look at one area in particular. In my review, I cited that the gameplay and structure of the levels were at odds with one another, with one major exception. There was one level in Super Mario Odyssey that not only was the best designed, but it actually made the rest of the game worse by comparison, and that is certainly worthy of being studied. If you want my thoughts on the structure and gameplay of Super Mario Odyssey, please read the review linked above first, as that will frame this discussion. If you watched any advertisement related to Super Mario Odyssey up to the release, then you know about the level New Donk City. Taking place in a New York-inspired setting, this level appeared at the quarter point of the game. Run by Mayor Pauline, who was the original captive of Donkey Kong back in the day, the level is teeming with detail. 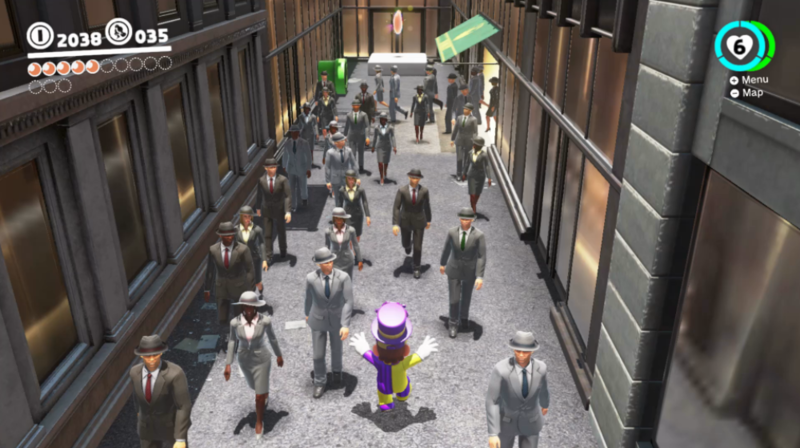 The player will see the bustle of regular-sized people walking the streets, to even Mario-related graffiti all around. As with the other levels, New Donk City goes through a transformation after the level’s boss is defeated. The first part takes place at nighttime during a storm. The player had to make use of construction beams and the rooftops to reach an electricity sucking boss. After that is cleared, the entirety of New Donk City became open for the player to explore. At this point, I want to talk about how the design of the level differs from the rest of the game. One of the major problems I cited in my review of Super Mario Odyssey was how divorced Mario’s gameplay was from the level design. Too many levels were about long expanses of running and didn’t offer the platforming focus that the series is known for. The only exceptions being the cutaway hidden sections that are built on one unique challenge to test the player. Due to how flat the level designs were, it also meant they were very linear in how the player approached them. Bowser’s Castle level was nothing more than a series of floating sections that had to be conquered in order. 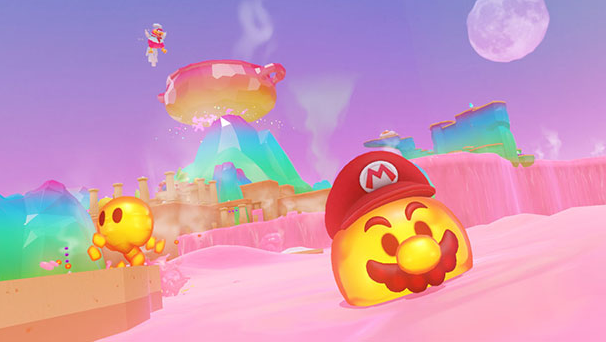 Even with the advanced moves that made use of Cappy, the level design was not set up to really let expert players take full advantage of it. New Donk City is the only exception to this problem. Of all the levels in the game, it’s the only one that felt right at home with Mario’s gameplay. Examining the level closer, we can see why that is. New Donk City’s skyline allows for the most verticality of momentum and structure than any other level. I know someone is going to comment on the Luncheon kingdom which was vertically designed, but it was still linearly focused. 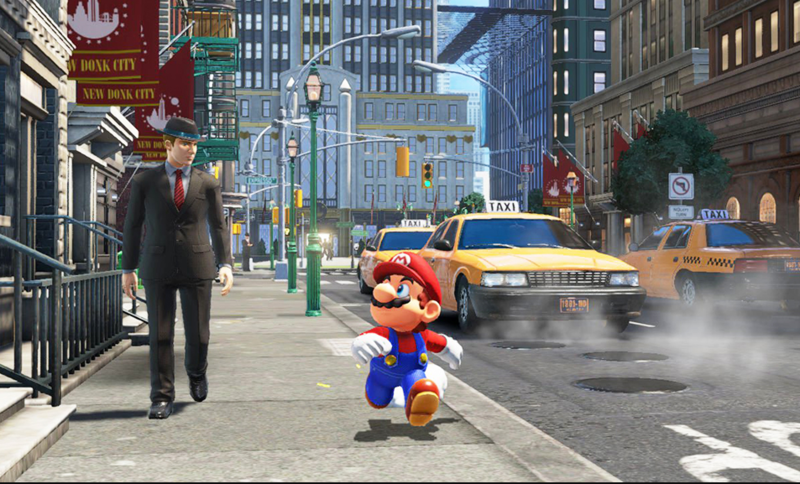 In New Donk City, the design allowed players to quickly transition from the ground to the skyline and vice versa. This was thanks to using cars as trampolines, the spark possession, or just using Cappy and your jumps to climb up the buildings. It wasn’t about Mario running from one end of the city to the other, but being able to jump and bounce any which way to get around. To put it another way, New Donk City features a smaller, but denser design; similar in structure to the areas in Prey 2016. There were enough walls and structures to set up elaborate wall jumps and long distance jumping from rooftop to rooftop. The sewer system offered another area to explore, along with the construction beams that were still around after the first section. Not only that, but New Donk City featured a special section involving the game’s main song and a celebration featuring Donkey Kong. New Donk City may have been the most detailed level in the game, but it was also the most varied. Again, this list does not count challenges that were repeated, or power moons in plain sight. Of course, New Donk City featured repeat moons as well, but from this list you can see that there was more variety. Even though the Luncheon Kingdom offers a greater vertical climb, it’s not as densely packed compared to New Donk City. New Donk City is a level that is worthy of being studied both within Mario Odyssey and separate from it. It’s a great example of the marriage between aesthetics, architecture, and the game mechanics. From my review of Odyssey, I felt like this level was given the most time and attention and could have been blown up to be a hub similar to Delfino Island in Sunshine. A great level needs to be built around the gameplay loop of your title, and New Donk City perfectly encapsulates every aspect of Odyssey’s gameplay. Perhaps the most telling feature is that the most “real world” level in a Mario game managed to provide the most over the top gameplay in the title. The problem with the other levels was that they were either not given enough focus, as with the boss worlds, or lacked the variety in gameplay seen in previous Mario titles. While New Donk City wasn’t enough for me to completely fall in love with Mario Odyssey, it definitely teased the possibilities of denser level designs for the Mario series.